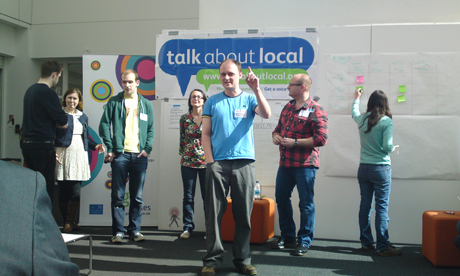 On Saturday the 2nd of April the Atrium was humming with energy as hyper-local bloggers from the length and breadth of the UK gathered for their annual Talk About Local Unconference. For some, these terms will require definition, which I have attempted below. Hyper- local = Hyperlocalism has been a massive growth area for the media. Bloggers and professional journalists alike are re-shaping the way in which people interact with their community by becoming ‘citizen journalists’ and publishing online content that engages people with what’s going on outside their front doors. Hyperlocalism is a broad church in terms of Geography (there are sites for single streets or whole cities) and content. From hard-hitting news stories to campaigns against litter and fly tipping, from broad global projects such as the 4am Project to highly niche undertakings by individuals, such as the Cardiff Arcades Project. As a form of media hyperlocalism is still in its infancy, however it’s growing up fast! Talk About Local= A project to give people in their communities a powerful online voice, check out their website for more. They organise the un-conference. UnConference = Conference by democracy. After open pre-discussions on a google group the content of the day was decided by attendees, who pitched ideas on what they’d like to learn or what they thought they felt they could share that would be helpful to others. Once the sessions were decided, they were allocated a time and a venue and attendees were free to mix and match their day to get maximum benefit. The sessions themselves were informal, taking an interactive seminar form where everyone was welcome to contribute. The mood was relaxed and everyone was very friendly, but the concentration was high and discussions were focused. The Twitter hash tag for the event was #tal11 and as people documented their experiences the feedback and comments are still rolling in. You can also check out accounts of the day from Guardian Cardiff’s beat blogger Hannah Waldram and Leith based Ally Tibbet of STV Local. As one might expect the conference has been covered extensively by the bloggers who were there, so we’re rounding up the online write ups for each session so you can utilise the information and become a hyperlocal hero! Getting the story this session focused on how to apply journalistic techniques to blogging, with a heavy emphasis on fact checking and building relationships with local sources, because everyone knows someone who knows everything about their area. Getting Started this one does what it says on the tin. How to get started! Activism many hyperlocal sites start to tackle particular issues, this session gave tips on how your site can make a physical difference in your community. Facebook can be tricky to get to grips with, especially for established bloggers who are used to doing things their own way. This session gave advice on how to get Facebook to work for your site. Postcode Stories this was a lovely interactive session on using social media to explore an area and create fictional narratives around local landmarks. 4am Project a hyperlocal photography project that has gone global, set your alarms for 3.55am on the 24th of April! Future of Hyper-localism Will Perrin started this session by telling us, no one knows the future of hyperlocalism, however it’s certainly not going away. Despite the obvious local links with Culture Secretary Jeremy Hunt’s desire to invest in Local TV, it seemed most hyperlocal bloggers have little time for this plan, preferring to continue forging their own online path. This is just a flavour of the day, so if you want more coverage and information on Hyperlocalism please keep checking the Talk About Local Blog where they will be creating an archive from the day.